Hot on the heels of Jazz by Toni Morrison, my brain was reeling from all the metaphysical imagery by the time I’d finished this. But at least I could relate to the protagonist in this one. All of us struggle with our identity from time to time. Those who don’t, I’d argue, haven’t realised they have an identity worth struggling over. Hesse writes this from personal angst and it fuels so much of what the characters go through. It gave me a great desire to read more about the man’s life so I’m glad I’ve got, sitting on my shelf here, a first edition of his biography which I’ll munch through at a later date.Although much of the imagery is fantastic in the extreme and I couldn’t relate to it, I did feel that the early parts of the book especially were worth reading for their exploration of the struggles that Harry Haller has. Haller seems to feel that he is the man people refer to when they say there’s always someone worse off than themselves. While this does border on self-pity and navel-gazing occasionally, I’d still rate this as an important book for anyone interested in what it feels like to have a great mind and no answers to life’s questions. Frustrating in the extreme no doubt. 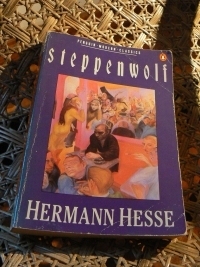 This book contains the records left us by a man whom we called the Steppenwolf, an expression he often used himself. Pablo was waiting for me, and Mozart too.